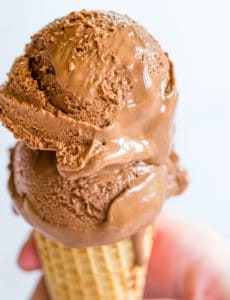 The famous "milkiest chocolate ice cream" from Jeni's Splendid Ice Creams - it's egg-free, rich, and has the most amazing chocolate flavor! In a small bowl, stir together 2 tablespoons of the milk with the cornstarch until smooth; set aside. Place the chopped chocolate in a medium bowl. Combine the remaining milk, heavy cream, evaporated milk, sugar and corn syrup in a 4-quart saucepan. Place over medium-high heat and bring to a rolling boil. Add the cocoa powder, whisk until incorporated, and continue boiling for an additional 4 minutes. Remove the pan from the heat and gradually whisk in the cornstarch slurry. Place the pan back over medium-high heat and bring back to a boil. Cook, stirring constantly with a heatproof spatula, until slightly thickened, about 1 minute. Remove from the heat. Gradually whisk the hot milk mixture into the chopped chocolate. Add the salt and whisk until the chocolate is completely melted and incorporated. Place the bowl inside the bowl with the ice water and let stand, stirring occasionally, until cold, about 30 minutes. Pour the ice cream mixture into the frozen canister of your ice cream maker and freeze according to the manufacturer's instructions. Pack the ice cream into a storage container and freeze until firm, at least 4 hours.